March | 2014 | we are judeo-christian, period! 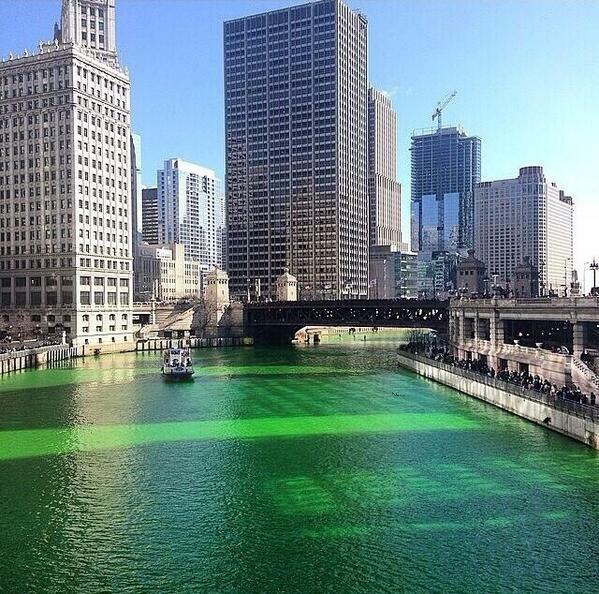 This is what our Chicago River looked like this past Saturday morning! This is as Emerald Green as you can get! 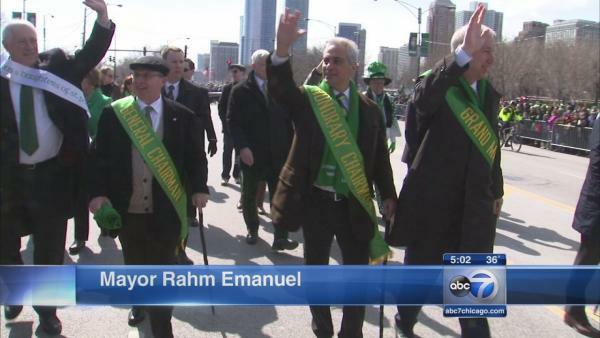 It was done early Saturday, around 9:30 am before the St. Pat’s Day parade began. 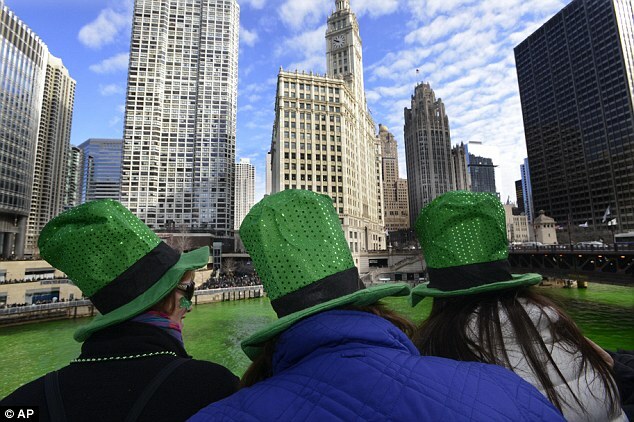 Every year, for over the last 50 years, Chicago has celebrated Saint Patrick’s Day by dumping green dye into the Chicago River and it stays that way for at least 12 hours. 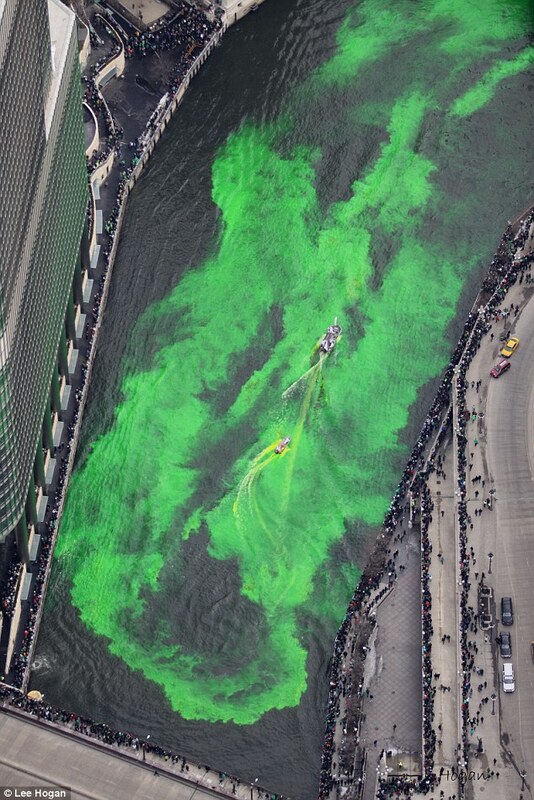 This tradition began back in 1962, when the plumbers’ union would dump flourescein dye along the river in an effort to detect toxic sludge. 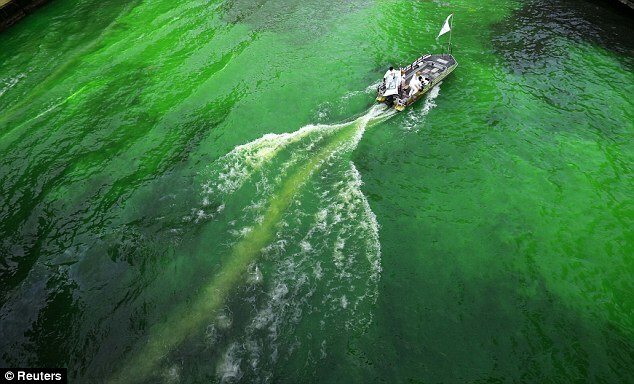 The water would turn bright green if any was found. 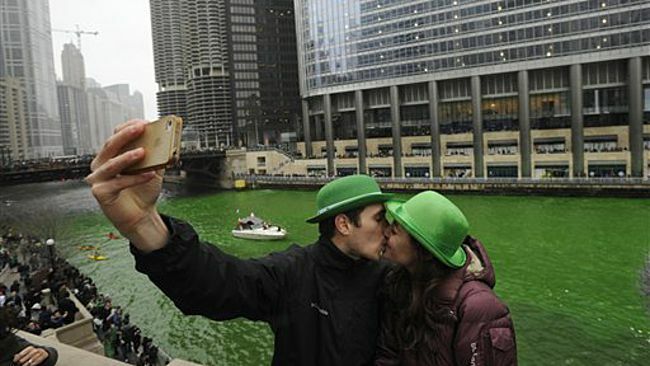 The plumbers still carry out this tradition but instead of using flourescein, they now use harmless vegetable dye. The plumber guys board motorboats and begin dumping the very carefully guarded secret formula into the river as onlookers cheer them on. and the weather was so great this past Saturday, (a balmy 53 degrees!) 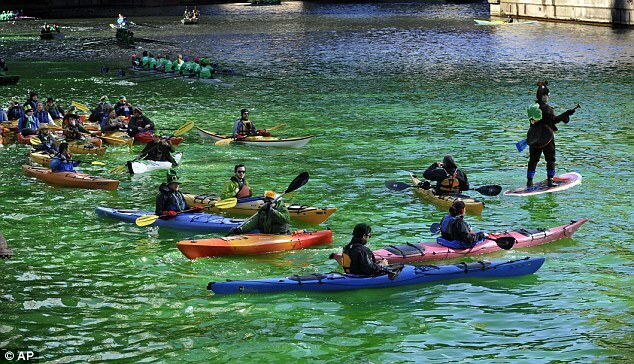 that some of the happy revelers could not pass up the opportunity to do a little kayaking as you see below. 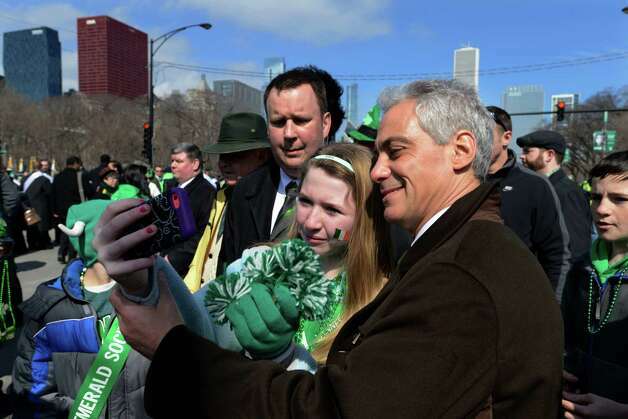 It was a great day indeed, just ask Mayor Rahm Emanuel. 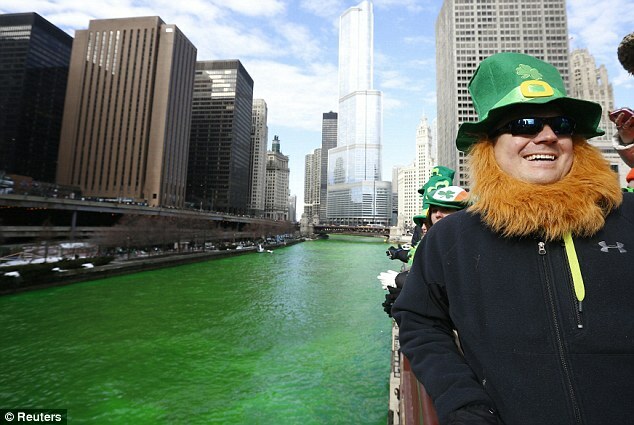 What better way is there to kick off St. Pat’s Day! Michael Flatly, himself and the original Riverdancers! Can you believe it? This is how far America has declined in world affairs. No one respects us anymore. We are becoming irrelevant. I never expected to live to see this day but it’s here and we have to deal with it. This timely article was mailed to me from the Hal Lindsey Ministries and I want to share it with you. Think about it. That means Putin, “The most powerful person in the world” according to Forbes magazine (and also the leader of Magog), and Obama, the second most powerful person in the world according to Forbes magazine, may both be operating in “fantasy”-land. However, it’s not totally unexpected. In fact, if you believe the Bible, it’s totally expected. Setting aside the influence of global and domestic politics and the Alpha Male posturing of both of these presidents, it’s not surprising that they are issuing dangerous threats and exhibiting some rather bizarre attitudes. The Bible says that will happen in the last days and, in fact, gives us an example of how it has happened before. The story of the ancient prophet Daniel provides a glimpse into what is unfolding right now in the world. It shows plainly that there is more happening than meets the eye when powerful nations collide. The Bible describes how Satan places his powerful “princes” (fallen angels) in positions to influence the leaders and events in the nations of the world. The more important the nation in Satan’s scheme, the more powerful the demon he places in charge. In fact, in Daniel’s story (Daniel 10), the archangel Gabriel was delayed 21 days when he attempted to deliver a message from God to Daniel. He was opposed by the “prince of the kingdom of Persia” and could only deliver his message after the powerful archangel Michael came to help him. Now that’s some serious spiritual warfare! So this tells us that when someone as responsible as Chancellor Merkel (whose father was a pastor) tells us that “another world” may be influencing the decisions being made in “Magog,” we should listen, but not be surprised. Folks, as I’ve said many, many times over the years on this program, we are seeing supernatural forces at work in America and in the world. There is no other way to explain some of the things that are happening. Too many of them defy logic and common sense. But, then, the prophecies concerning the final days of this Age have consistently bumfuzzled the critics. Their favorite argument is that we shouldn’t believe the Bible because there’s no way some of the events it predicts can happen. 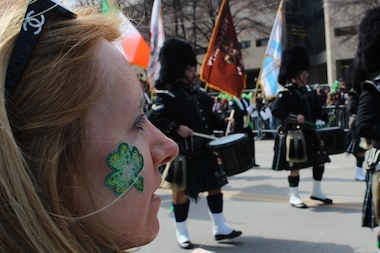 What do they say when that stuff actually happens — as we’re witnessing today? Their silence is deafening. But just remember, though what’s happening in America and in the world is disturbing, even frightening, these are not uncharted waters. The truth is we have a detailed map of these times that lays out precisely the order of events. If we’re smart, we’ll take note of these warnings and prepare ourselves and our families for what is about to break upon us. Most importantly, though, don’t lose hope in Jesus Christ. God gave us very specific, strong, immutable promises on which we can rely in the coming days. And God cannot lie. If He said He will do it, He will. Just trust Him and keep looking up! Don’t miss this week’s Report on TBN, Daystar, CPM Network, The Word Network, various local stations (no CET stations this week), http://www.hallindsey.com or http://www.hischannel.com. Please check your local listings. If you live in the great state of Georgia please vote for Congressman Broun and tell anyone else that you know who lives in Georgia, to do the same. Our country can use a few good men like Broun in the senate to help turn things around. He will replace Senator Saxby Chambliss, who is retiring.